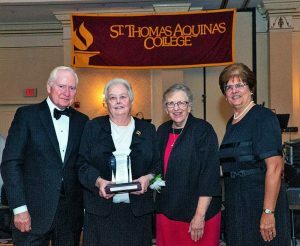 Dominican Sister of Sparkill Mary Elizabeth Mooney, OP, principal of St. John Chrysostom School in the South Bronx, is the 2018 recipient of the Founders Award at St. Thomas Aquinas College. And, Dominican Sister of Sparkill Cecilia La Pietra, OP, Executive Director of One-to-One Learning, was presented with this year’s Rockland County Outstanding Non-Profit Professional Award. Read below for more information. Congratulations to our Sister Mary Elizabeth Mooney, recipient of the 2018 Founders Award at St. Thomas Aquinas College. Principal of St. John Chrysostom School in the South Bronx, Sister Mary Elizabeth has been a devoted educator and mentor at the school for 44 years. Left to right: Dr. Donald J. Riley, Chair of St. Thomas Aquinas College Board of Trustees; Sister Mary Elizabeth Mooney, OP; Sister Mary Murray, OP, President of the Dominican Sisters of Sparkill; Dr. Margaret Fitzpatrick, SC, President of St. Thomas Aquinas College. 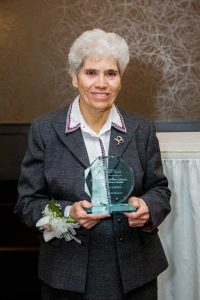 A devoted educator and mentor to generations of teachers, Sister Mary Elizabeth joyfully continues to serve the children and families of St. John Chrysostom School. Under her leadership, St. John’s, located in the poorest Congressional District in the nation, has been recognized as one of the premier Catholic Schools in the Archdiocese of New York. On November 8, the Rockland Development Council presented their 2018 Outstanding Non-Profit Professional Award to Sister Cecilia La Pietra, Executive Director of One-to-One Learning, for her leadership and for her commitment to working for and with marginalized people in Rockland County and beyond. In February 1993, the Dominican Sisters of Sparkill conducted a study of the educational needs of the growing numbers of immigrant families settling in Rockland County. By 1994, an English as a Second Language program was established. As it became apparent that both numbers and needs were increasing, One to One Learning, Inc. was established in 1997 with Sr. Cecilia LaPietra as its first Executive Director. Twenty-one years later. Sr. Cecilia along with her staff and over 60 volunteer teachers and tutors offer classes in English, pre-GED, citizenship, literacy, computer skills, and a myriad of other essential skills responding to everyday needs of children and adults.